The kit comes with a diffuser (you choose which one! 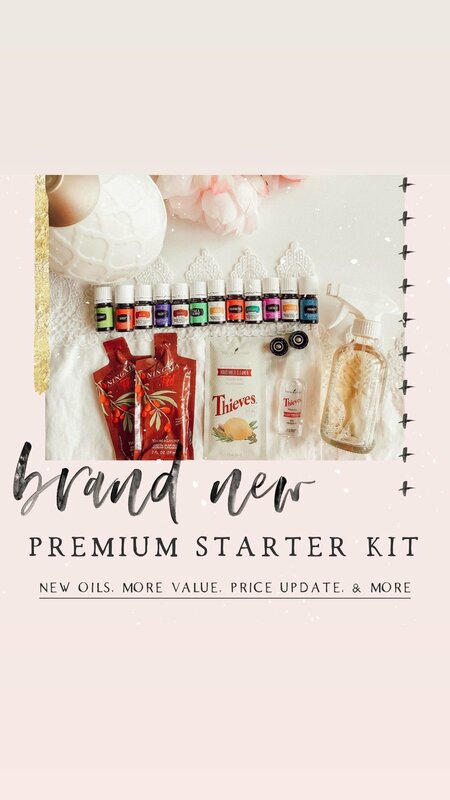 ), 12 of the most popular oils, a roller, samples, and awesome literature! Plus access to our FB oil group. + Thieves - the healthy-keeper. It helps clean the air, boosts immunity, makes our digestive systems work their best, and is just the greatest. + Citrus Fresh - Combining Orange, Tangerine, Grapefruit, Lemon, and Mandarin oils with a hint of Spearmint. You can add it to your water and we love it on our dryer balls. + Raven - blend of Ravintsara, Peppermint, Eucalyptus Radiata, and other essential oils. Raven creates a cooling sensation when applied topically to the chest and throat. + Lemon - naturally highlights hair, maintains energy levels, helps oily skin, calluses, cellulite, detoxing your body. The works! + Stress Away - exactly what it says. We roll it onto our wrists and the back of our necks anytime we want it. + Peppermint - helps me enjoy springtime outdoors, keeps my head happy, supports digestive system, promotes proper nasal and respiratory function! I'm obsessed. + Panaway - so many types of relief. Helps with occasional head discomfort, everyday joint and muscle soreness, and that time o' month cramp suckiness. + Lavender - "the Swiss Army knife of essential oils." We use it for enjoying the springtime outdoors. great for relaxation, sleepy cream, a calm environment for kids & grownups. SO GOOD! + Valor - supports emotions. We like to call this one courage in a bottle. + Peace and Calming - supports sleep. Roll this on spines, feet and wrists for a very calm and relaxing vibe.